Services: Aquarian Mass or Aquarian Communion from the Reserved Sacrament each weekend. 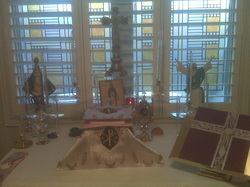 Stations of the Resurrection each weeked before Mass, Easter - Pentecost. Aquarian Rosary, Vespers, Solemn Benediction and the Liberal Catholic Healing Service also available. Services: Aquarian Communion from the Reserved Sacrament. Aquarian Rosary also available. Services: Aquarian Mass or Aquarian Communion from the Reserved Sacrament during weekends we travel to St Louis or Chicago. 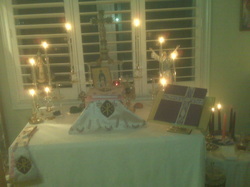 Stations of the Resurrection before Mass, Easter - Pentecost. Aquarian Rosary, Vespers and the Liberal Catholic Healing Service also available. 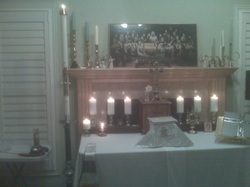 Services: Communion from the Reserved Sacrament, Sundays at 9 a.m. Rosary is scheduled the 3rd Sunday of the month. Bible Study is each Wednesday.